The BOSS KATANA 100 Watt Guitar Amplifier Head has been designed with the touring musician in mind, opening a universe of tonal qualities to provide the discerning musician with the true next-generation rock amplifier. Taking its name from the Katana - the traditional sword carried by the historic samurai of Japan, a symbol of honour, precision, and artistry in Japanese culture -, the 100-watt head takes on these characteristics. The result is gorgeous - cutting rock tones and epic presence encapsulated in a sleek yet visually striking design. Perfect for live use or studio recordings, the amp also features an innovative Power Control for cranked-amp tones at all levels. The 100-watt Katana head delivers a plethora of rich sounds for guitarists in need of a versatile head that can deliver - always. The 5 original amp characters, Clean, Crunch, Lead, Brown and Acoustic offer something for all guitarists. From beautiful vintage sounds to the coveted Brown sound and crystal transparent clean tones, this amplifier has it all. The design behind the flagship Waza amp has been integrated into this amplifier head to ensure optimisation between the head and cab, providing you with the punch you need and the cut-through presence that you could previously only associate with higher end amps. 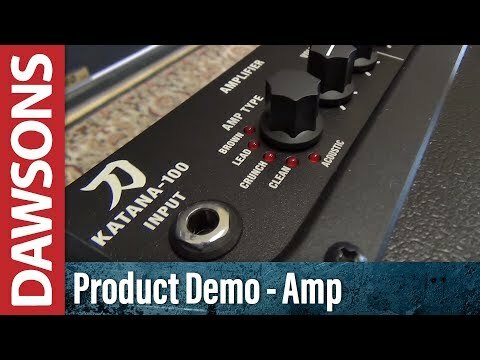 You can also take advantage of an array of free amp and effects setups specifically created for the Katana series which have been created by pro guitarists. Just visit the BOSS Tone Central website and get started with ready-to-play sounds for a variety of musical styles. Although the Katana 100-watt head has a range of built-in effects and recallable Tone Settings, you also have access to 55 additional effects, all of which are customisable to your needs. Connect to the BOSS Tone Studio via USB and enjoy an array of effects such as distortions, reverbs, delays as well as pitch shifting, ring mod, slicer and more and load them to the Katana for use live. The Katana 100-watt head’s speaker out allows you to connect to the 8-ohm or 16-ohm cab of your choice. For those who need a direct signal, you’ll be pleased to know you can send a direct feed to your PA or recording setup via the Line Out. In addition, this Line Out will provide authentic “mic’d up” tone with all the power and dynamics you need. You can even send the same mix-ready sound to your computer via USB. Those who need extra connectivity will appreciate the effects loop and MIDI input which can effortlessly integrate with external effects as well as your MIDI switching devices such as the BOSS ES-5 and ES-8. BOSS products are known for their sturdy construction and the BOSS Katana 100-watt head is no exception to the rule. Not only are you getting an innovative amplifier born from the Waza amp DNA, but a strong and sturdy housing that will last years of touring. Weighing in at a mere 8.8kg, this is easily transportable to and from the studio or home practice when you decide to take advantage of the built-in 5-inch speaker, and will happily last la lifetime of touring in the back of a van!